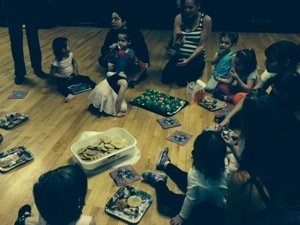 On May 3, 2014 May 3, 2014 By JillIn Mommy Musings, Thirty day challenge - Make it, Do it, Love it, What's Going On? Seems like a whirlwind of a day! Make up dance class and last class for Gia’s friend, Kailey, who is currently on the road to their new life in Indiana! Really going to miss them! 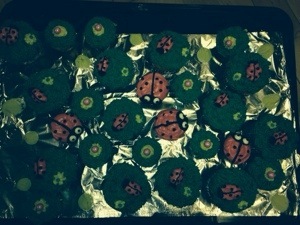 For a good bye party, one mom, Dana made these luscious Ladybug cupcakes! So incredible! The picture doesn’t do these cute cupcakes justice! It was really dark and not a great picture. Gia was dropped off and then we drove back to Gia’s old school to meet up with her best friend Giana and sign her up for a few weeks of camp! We saw her old teachers! So funny because they saw Arianna and thought it was Gia! 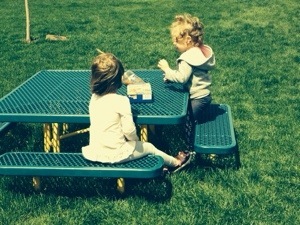 So great seeing one of my favorite friends, Jessica, and just enjoying the beautiful weather at the playground ! 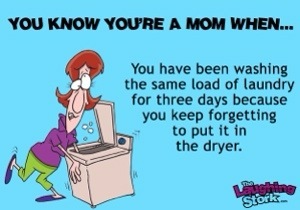 My house is a total mess, so much laundry to do…It. Never.ends! Neither does the clutter! I truly need a house cleaner! And…I have a zillion things to organize and get… It seems that way these days! Sure is hard not having ANY help! I know I don’t technically work, but I always feel stressed! So, the point is, I was hemming and hawing about meeting up and then I just got in the car. Fast forward to later in the day – so worth it! Nothing is that important that you can’t take your kids to the playground and meet up with a friend for an hour or two…Moms need mom friends!!!! It is so important! Love my friends and that is my happy thought of the night! Have an awesome weekend everyone!